Daytona Corporation has been a leader in motorcycle parts industry since 1972. We provide original and customized Motorcycle parts and accessories to the International marketplace. 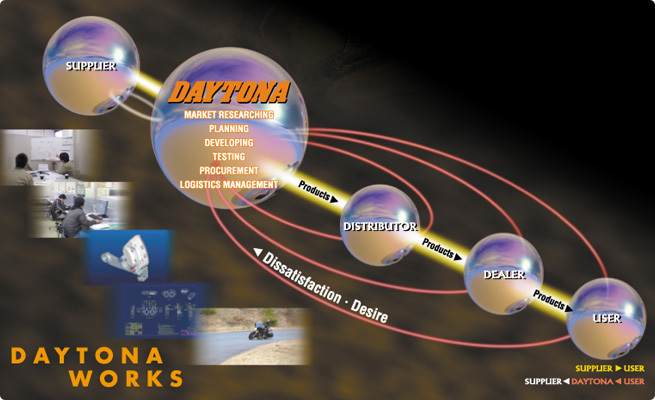 Daytona is a R&D company and an exporter for original motorcycle parts. Our specialty is R&D functions to develop original motorcycle parts and accessories which meet the demand in each country upon request. We are No. 1 in the following field. Most comprehensive range of quality performance and custom motorcycle parts in several markets like Japan, Hong Kong, Indonesia etc. Most comprehensive range of Quality Harley Davidson parts supplied from Japan to the U.S.A.
We do not sell directly to the individual overseas customers and make a point of supporting our authorized overseas distributors. We are a distributor of high quality motorcycle parts and accessories in Japan, as well. Daytona 93380 Mountbar with USB, Clamp Short Black It will be able to install handlebar accessori..
Daytona 93381 Mountbar with USB, Clamp Short Low Black It will be able to install handlebar acces..
Daytona 79339 Slim Switch (T:13.5) Nylon Flat Seesaw / 15A Fits models: General purpose (required..
Daytona 86533 Nano 2-Gear Gauges with Backlight Gear Shift Indicator Display range N,1,2-8 Selec..
Daytona 87239 Power Supply USB 1Port & Cigarette Socket 1Port..
Daytona 87406 Power Supply USB 2Port..
Daytona 91107 Slim Switch (T:13.5) For Headlight H4 Bulb Handlebar Diameter: It corresponds to 22..
Daytona 92386 Compact Volt Meter 7.5-18V Maximum Value Memory Function Size:/Width 42mmxlength 2..
Daytona 92601 Smart Phone Holder IH-550D Rigid Minoura iH-220/520 (body center screw type) Daytona ..
Daytona Smart Phone Case Quick HANDLEBAR MOUNTED WEATHER RESISTANT SMARTPHONE CASE MAX PHONE SIZ..